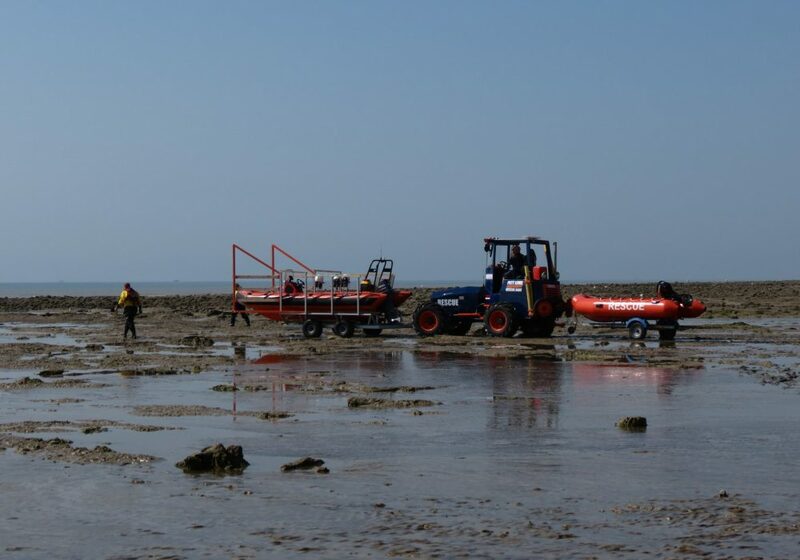 Today’s training … low tide, high risk manoeuvres! 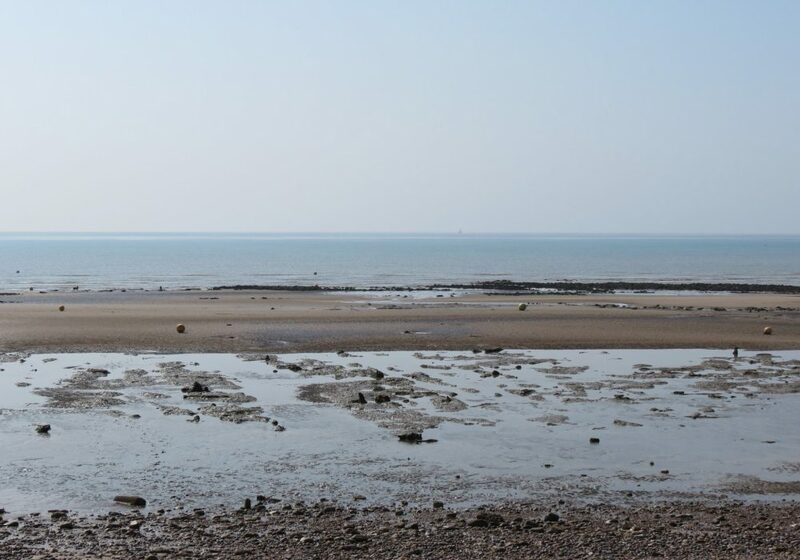 This weekend saw some beautiful weather along the Pett coastline, although as the season’s changing, so is the temperament – and temperature – of the water! 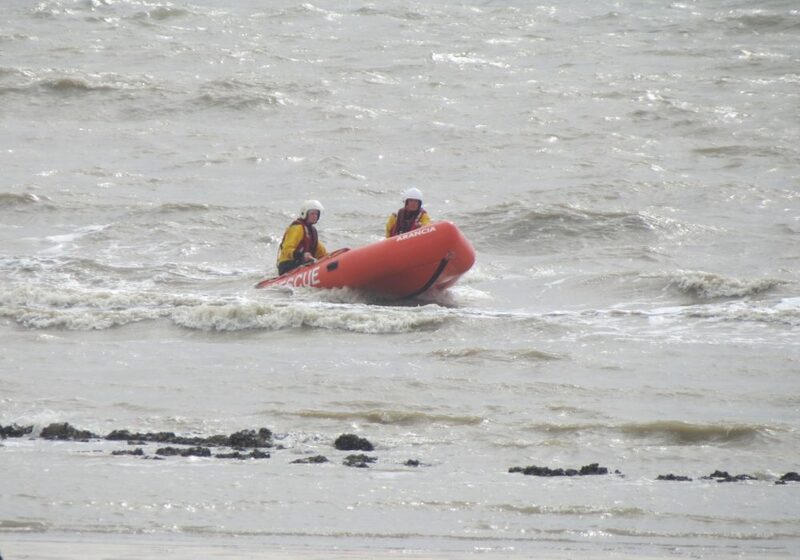 Despite being a low tide on Sunday (16th September 2018) the high winds created a very swollen, rolling sea which provided the perfect setting for two-man crew casualty recovery training. 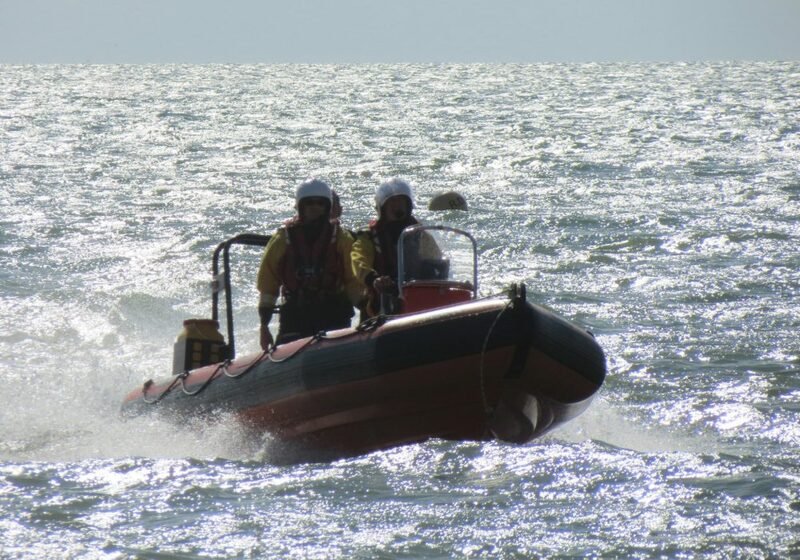 This involved practising recovery of a person overboard in fairly rough seas. 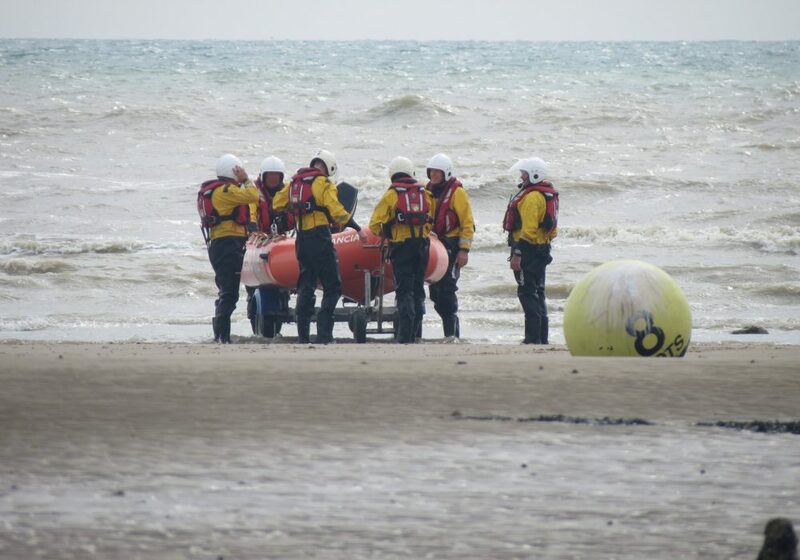 Rather than put a crew member at risk in the swollen sea, the crews used a buoy as the person, in this training scenario. 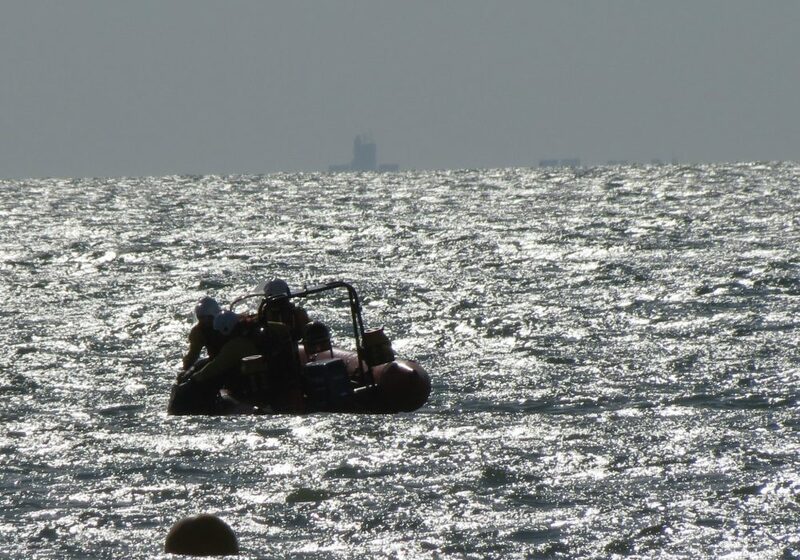 For this, the Tornado boat was launched, with successive two-man crews as running the training scenario across several crew changes allowed as many trainees as possible to take part and practise, and also allowed for different team dynamics across the crew pairs. 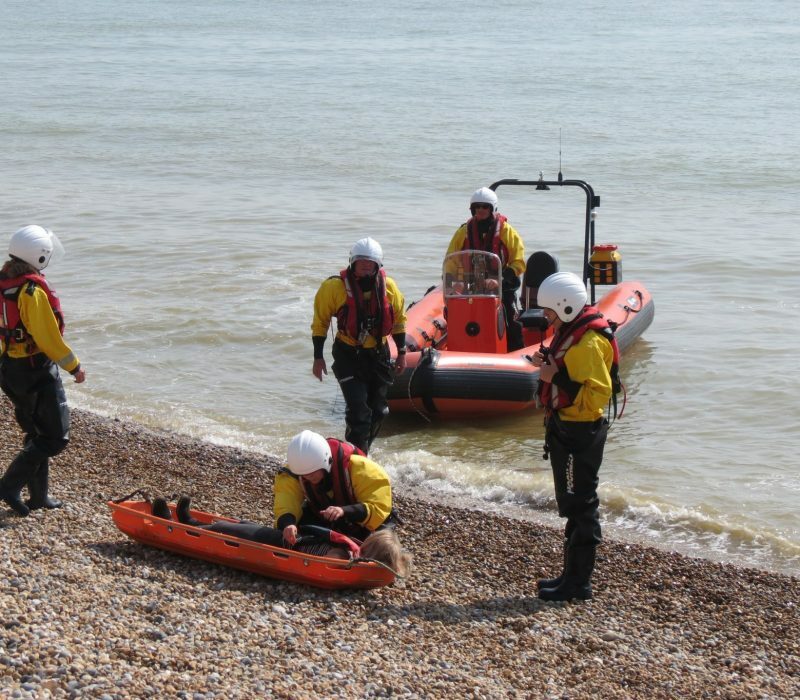 This gave many volunteers to work in a crew with someone they may not have teamed up with before. 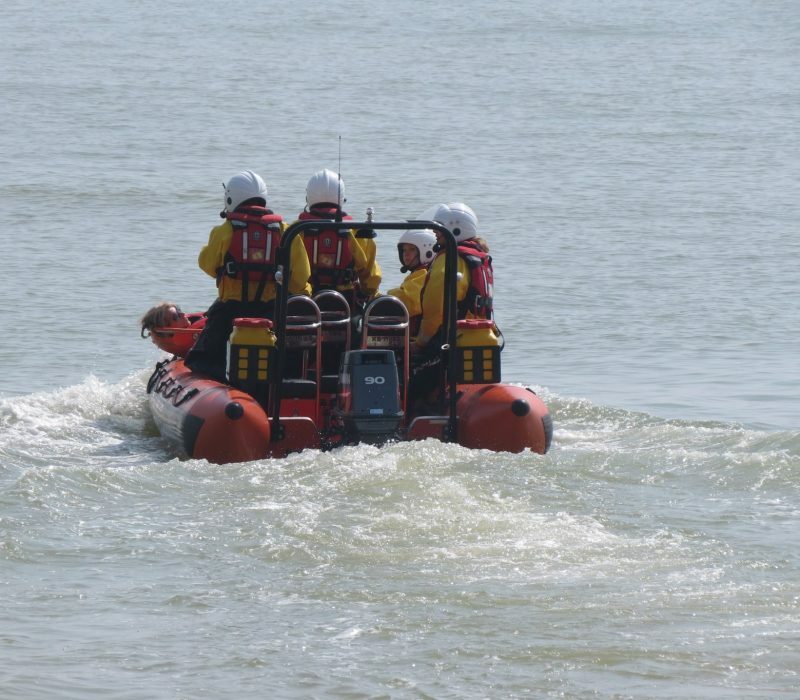 In their pairs, each team practised manoeuvring the boat in rough conditions. 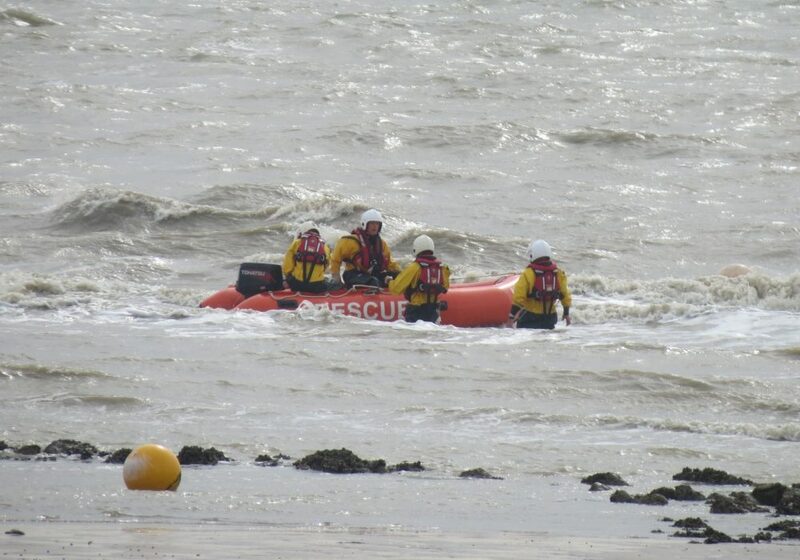 Continued practice of this kind of rescue in all types of tidal, weather and beach conditions is essential so that rescue teams can rehearse best-practice for recovery, i.e. 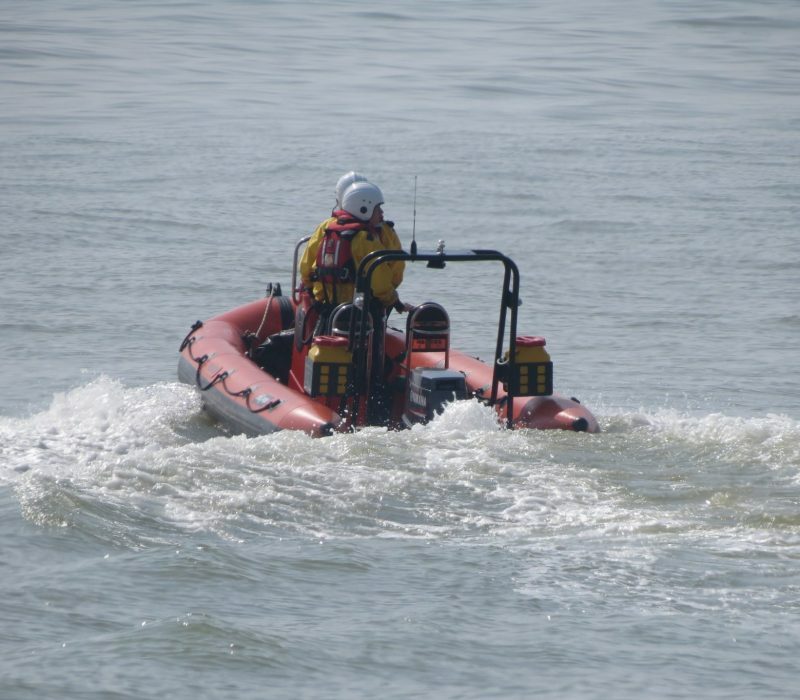 minimum risk and endangerment to crew, boat and any casualty in the water. And it wasn’t just our own volunteers practising for all eventualities today … everyone down at the boat house and on the beach was treated to a very close up fly-by from our rescue colleagues in the coastguard helicopter, who were heading to the cliff face at Fairlight for their own training manoeuvres. In all, a busy day’s training for local teams! 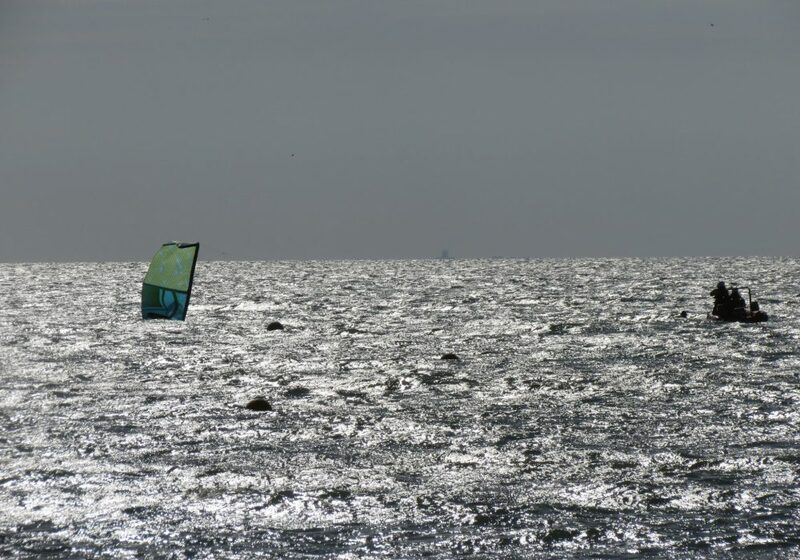 This morning’s session down at the base saw a windy day, high tide and plenty of activity! 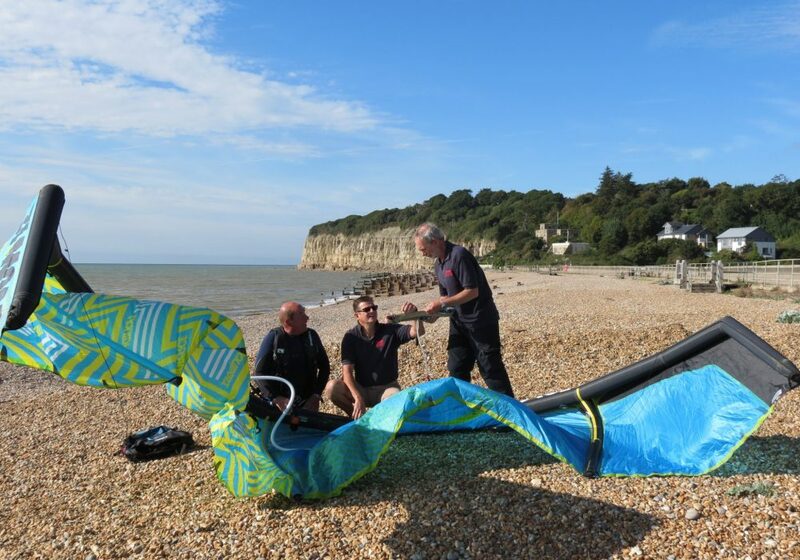 First up, crew trainee Rob brought his kite surfing equipment down to the session so that crews could learn about the equipment and practice rescuing a kite surfer. 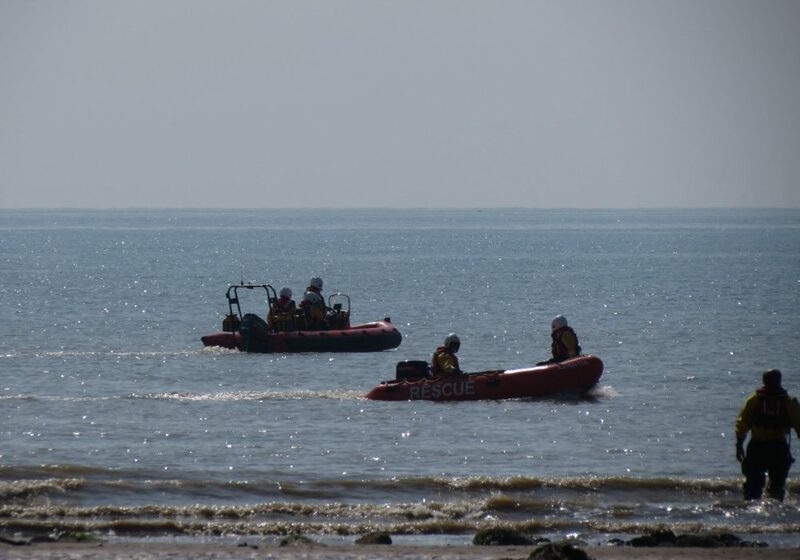 This is extremely important training for the crews as Pett Level beaches are very popular for water sports such as kite surfing and paddle boarding – there was already a paddle boarder on (and in, at times) the water today too! 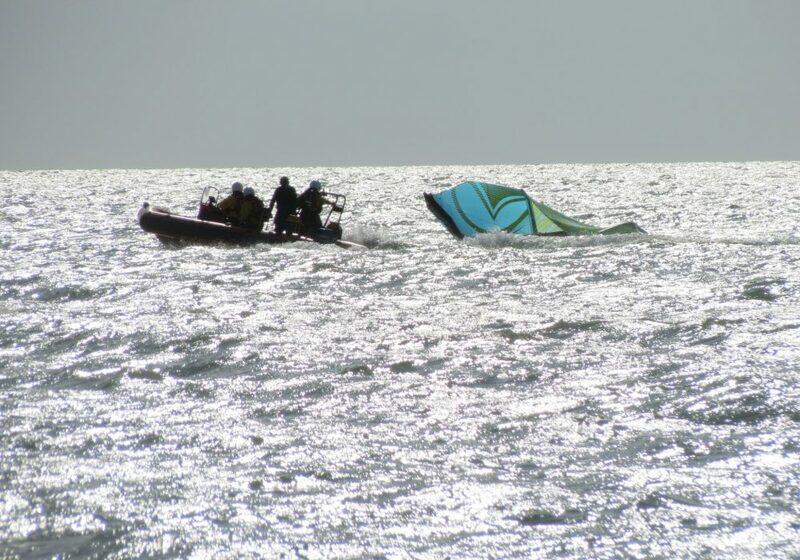 Having a volunteer who’s also a kite surfer gave us the opportunity to experience what’s involved in this type of recovery and to practice how to manoeuvre the boat around the additional risk of the kite’s lines, as there’s a bit risk of the lines or the kite itself becoming entangled around the boat’s propeller. 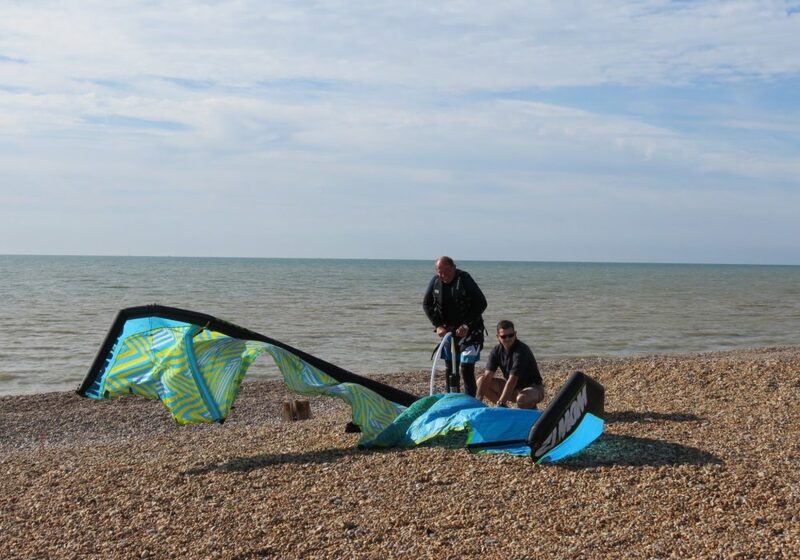 Training allows the crews to practice an approach which does not involve getting between the kiter and the kite. 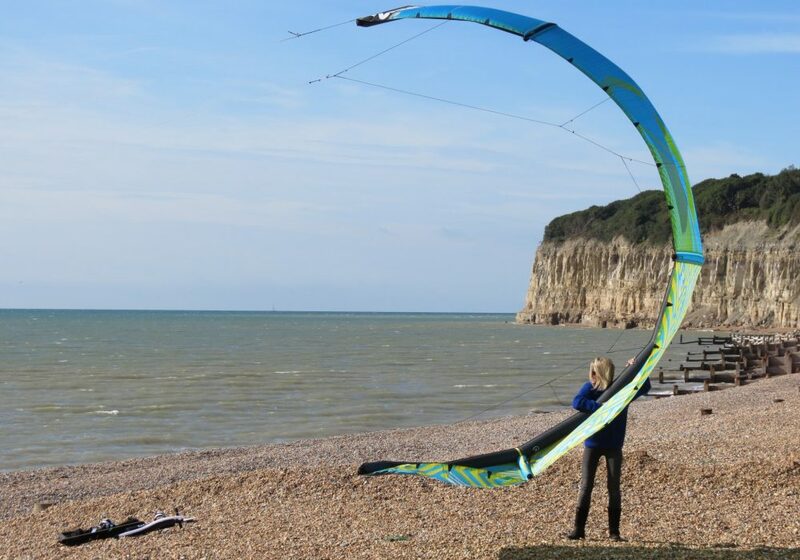 In a sport such as kite surfing which relies on wind and surf, both of which can be very unpredictable, kite surfers who fall from their boards are themselves at risk of being caught up in the lines and unable to swim or float to safety. 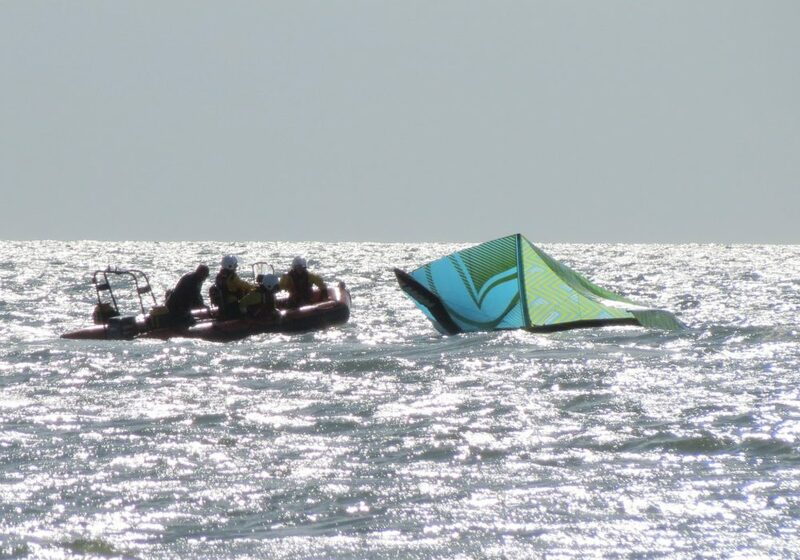 In a rescue situation, if the kiter is caught in the lines then they are at additional risk of being pulled under by the boat if the boat interferes with the line. 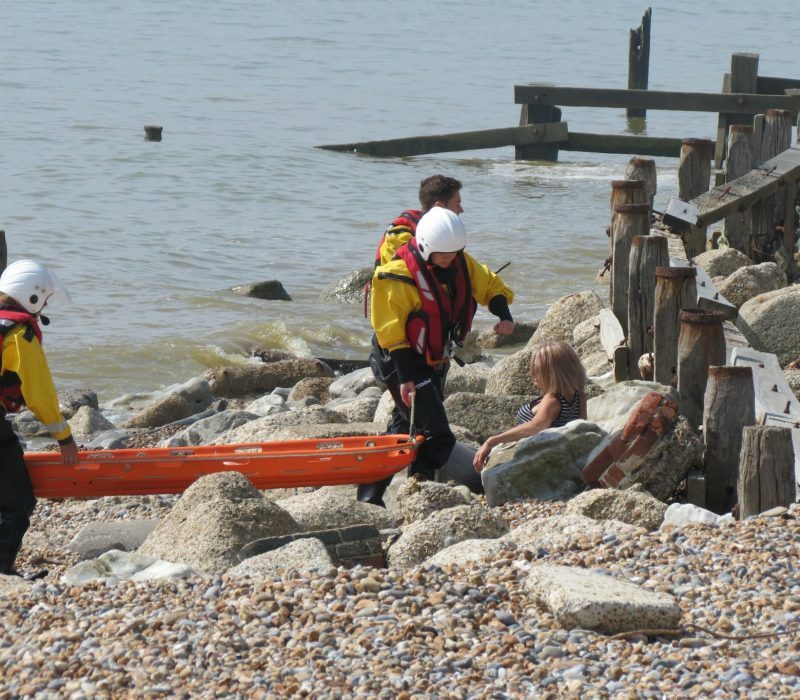 All of this alongside the regular risks posed to a person in the tidal waters around this part of the coastline! 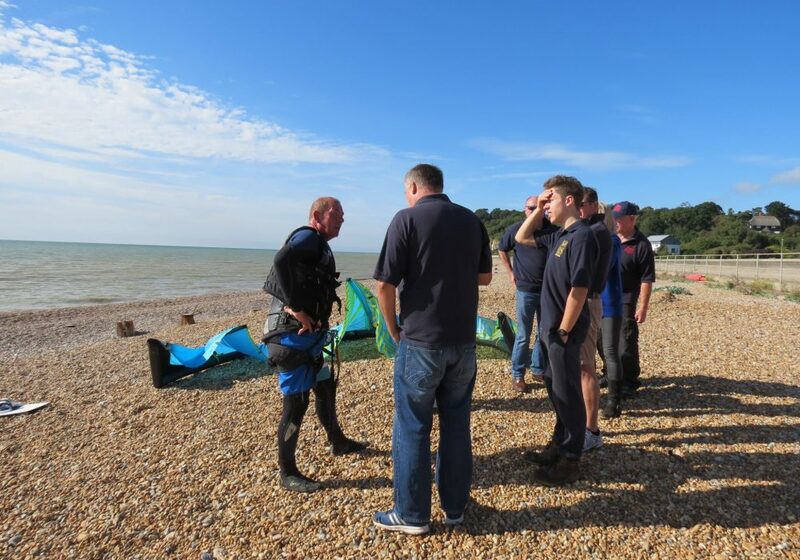 And of course, there’s every possibility that a person in the water could also be a casualty, so as well as last week’s First Aid training to help support overall training, having a kite surfing volunteer meant the chance to prepare for a scenario involving a casualty in the water. 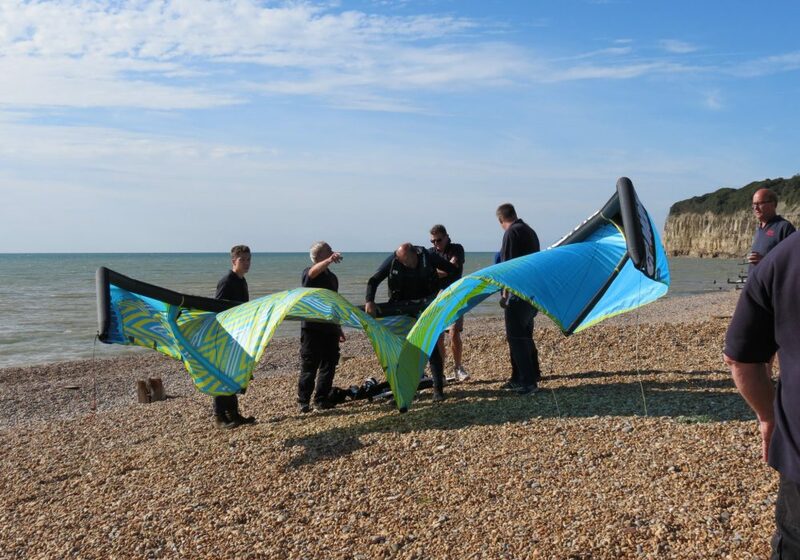 Trainee Rob gave the crew a quick tutorial in how the kite surfing equipment works, so they would be aware of the component parts and the way the lines join the kiter to the kite (through being attached to the kite at one end and kiter’s harness at the other). 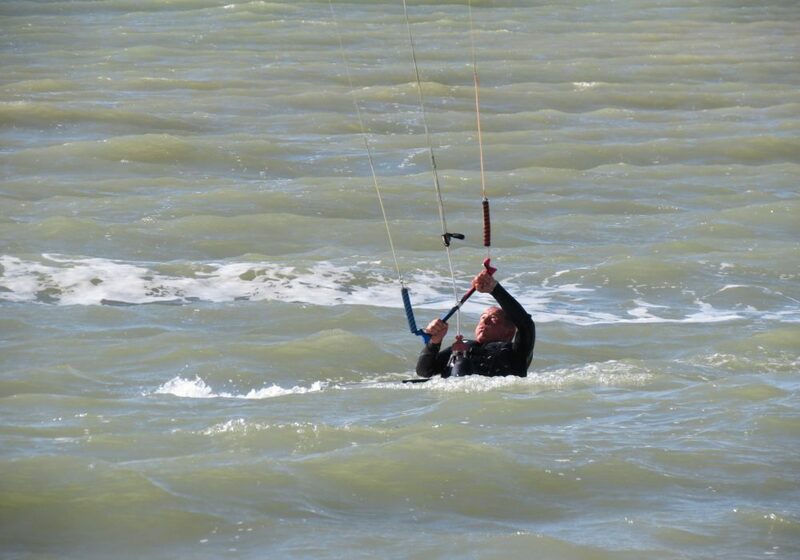 In the rescue scenario, Rob released the kite so that kite came lines on the top of the water. 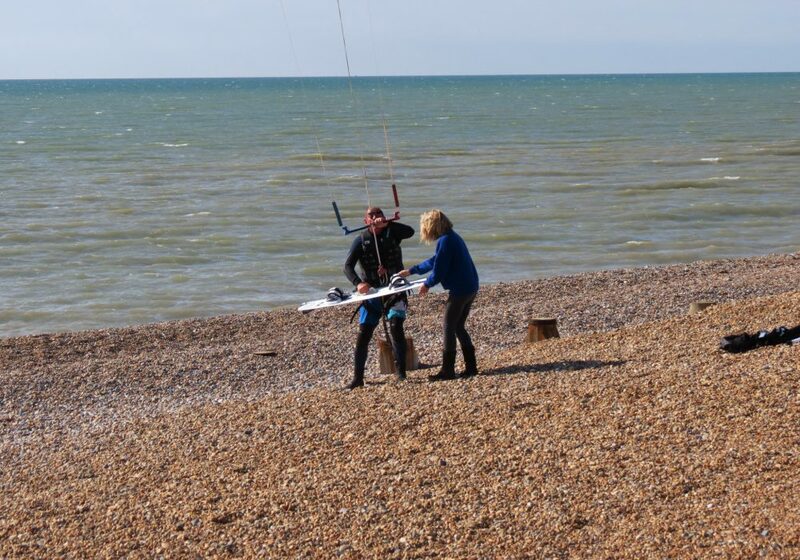 The crew then rescued Rob and moved downwind of the kite so that the kite came to the boat for an easier retrieval. 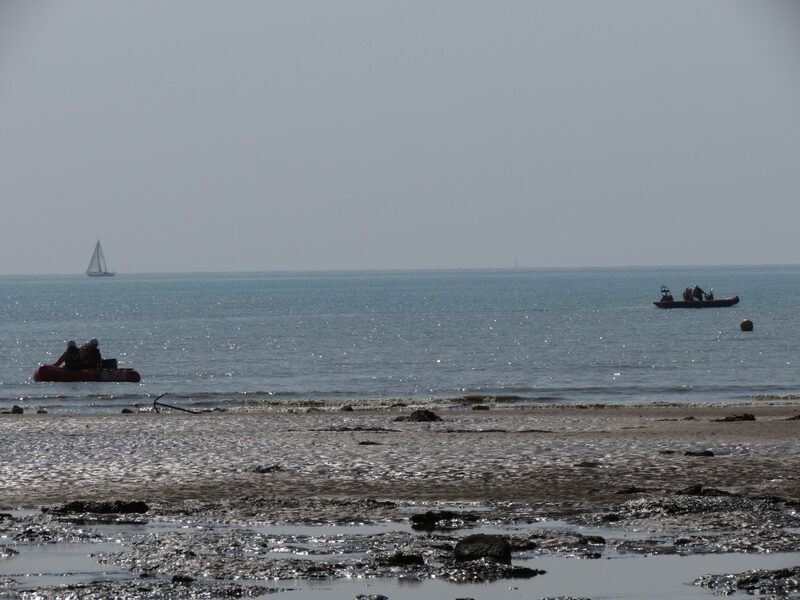 Then there were extra visitors and activities going on, with a special ‘boat trip’ which was a prize in a local charity auction, raising funds for the PLIRB. 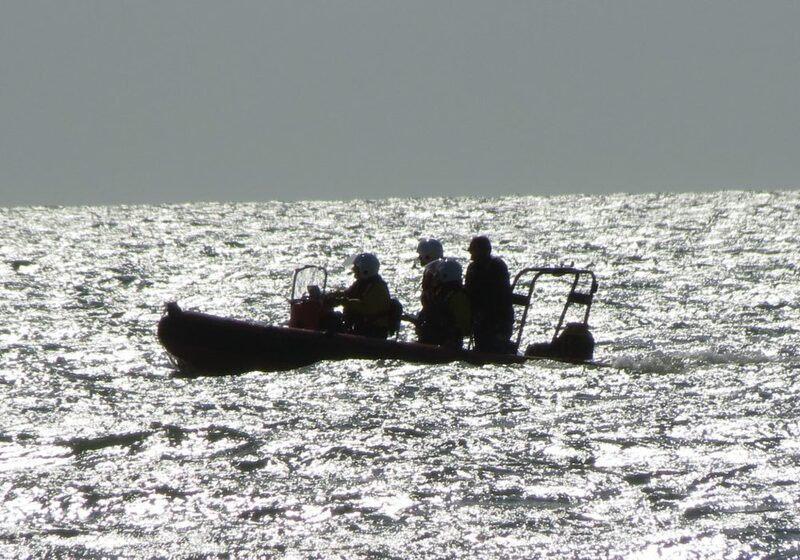 The last part of today’s session saw another trip out for the boat crew to scatter ashes for a bereaved family, whose loved one held a real affection for these shores and the work of the Pett Level Independent Rescue Boat. 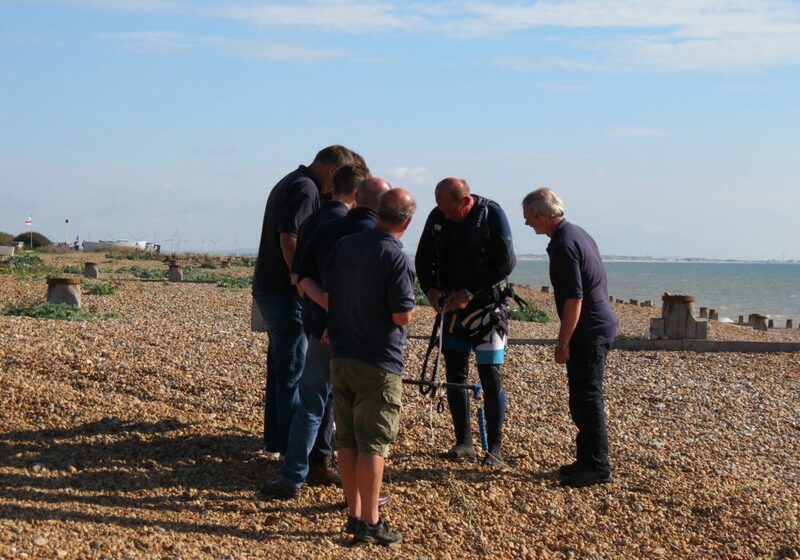 We are honoured to have been able to help. 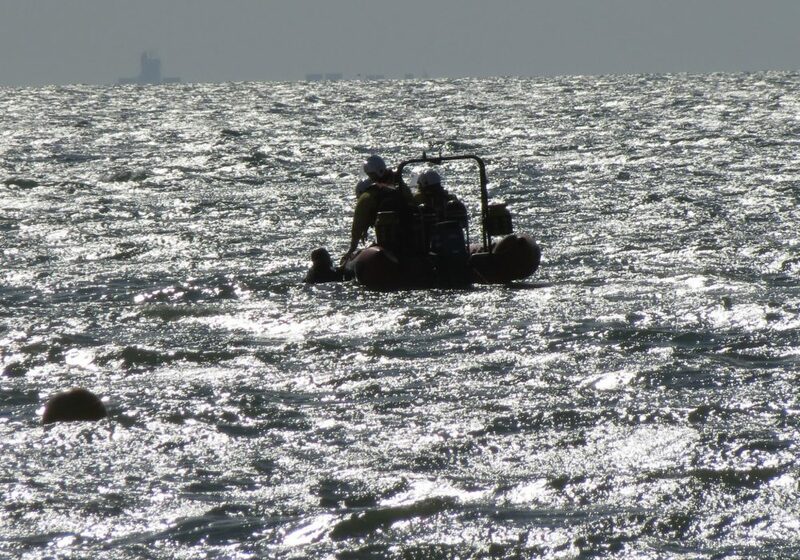 So, a busy day and every single aspect of it in the very good cause of ensuring that we offer the very best professional rescue service we possibly can for our local community and visitors. Apologies for the lack of clarity in some of the photos … today’s training action took place right under a very bright sun and, with the glare of the water and from the distance of taking the photos from the shore, it’s meant quite a few silhouetted shots. 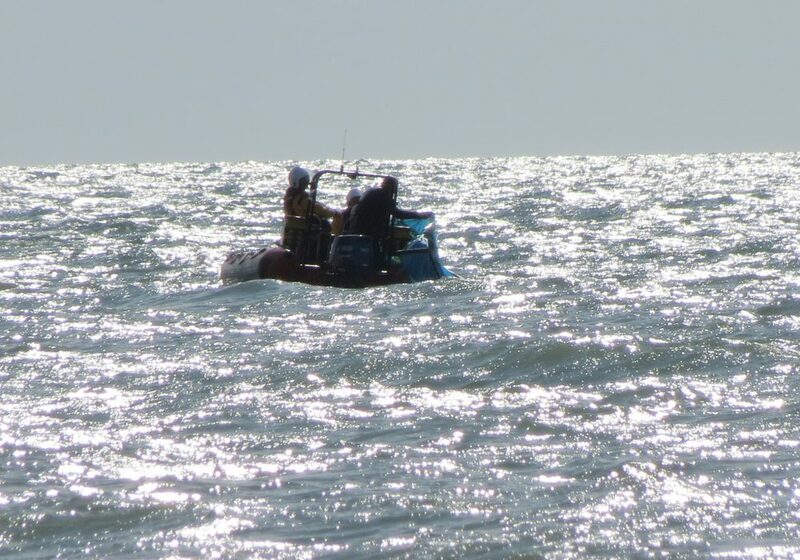 However, it’s still great to be able to view the crew in action, and to see the local coastline in all of its sunlit glory. 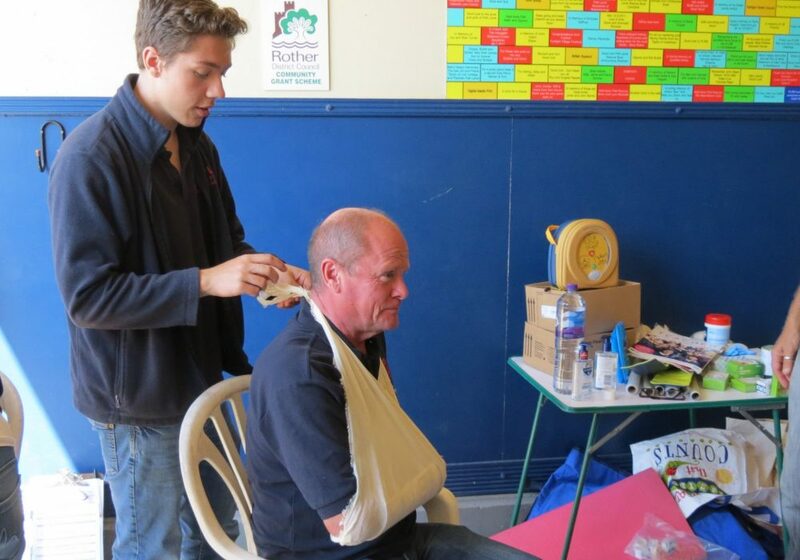 Last weekend’s training took the whole weekend, with 9 base and boat crew volunteers taking part in First Aid training. This is the first wave (see what we did there?) 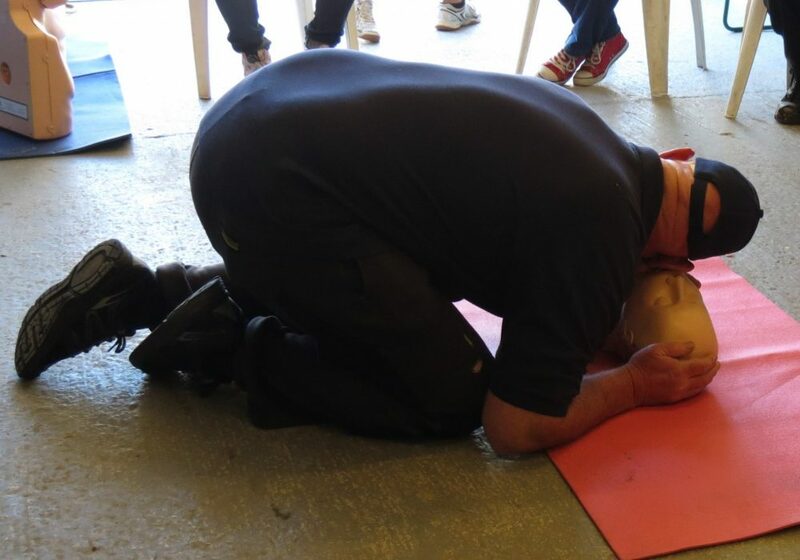 of refresher training for established crew teams and new training for the latest volunteers, for the Level 3 First Aid at Work course. The first part of the course involved 6 hours of in-depth online training, then two days of practicals delivered by tutor Corrina Anderson, who was amazing in guiding everyone through the practicals and in ensuring that our understanding and competencies are fully in place so that, if the need arises, we can be there to support any emergency, or rescue situation with the appropriate first aid until the emergency medical services arrive. There were plenty of action shots taken across the two days. 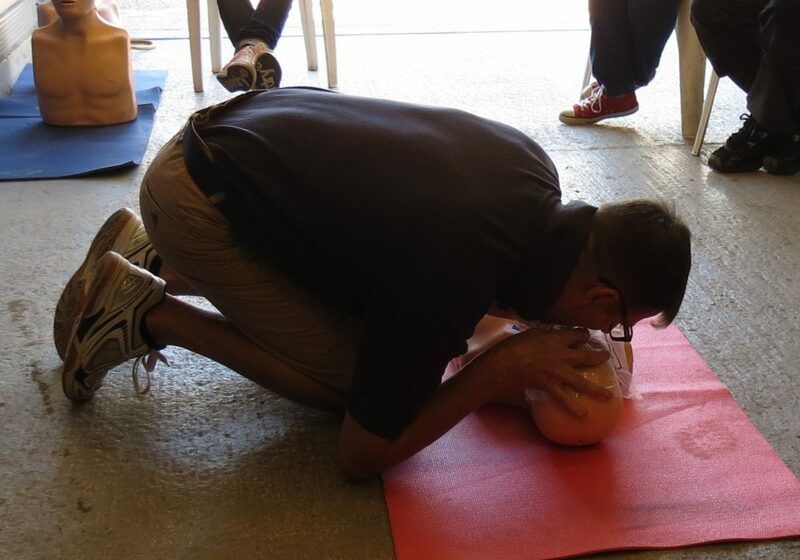 Day 1 provided quite a few out-takes as those newbies amongst the crew got to grips with slings, CPR and burns first aid. 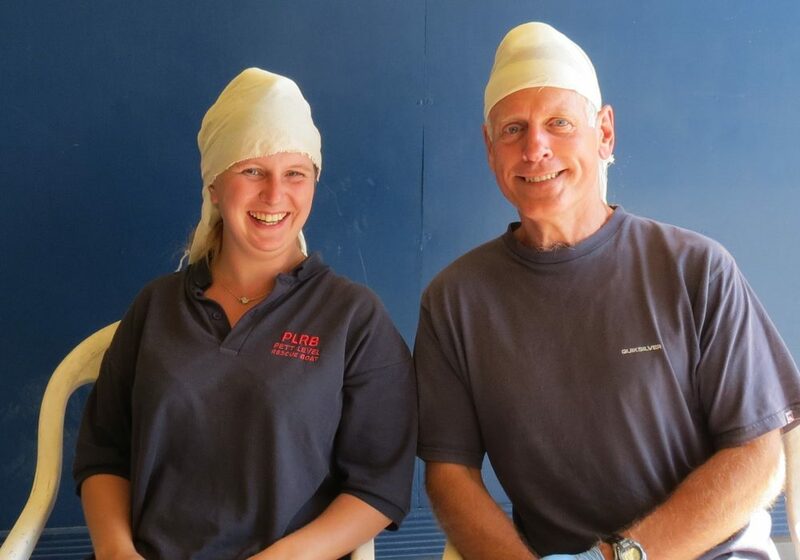 Passers by were treated to the sight of us all in the boathouse all gloved up and in various stages of dressing (s)! But such sights were all in a good cause as by the time the assessments took place on day 2, our practice had paid off and we were able to offer a clean sweep of competencies when it came to the practicals, the written / oral questions and our reflective practice: with all 9 volunteers passing the course. 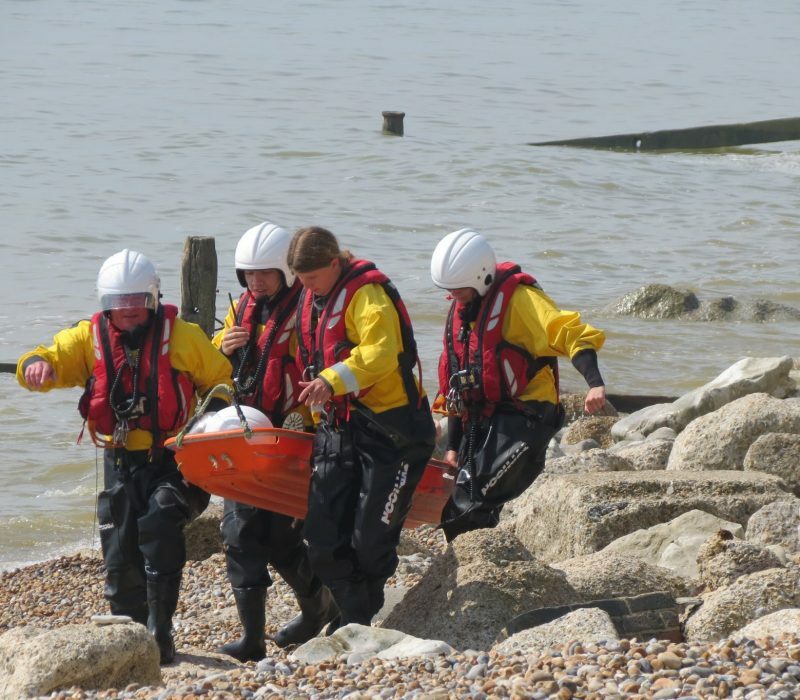 Of course, we’d prefer never to have to use any of this training, but beaches can be dangerous places and accidents happen so it’s essential to have the skills which help us prepare for any eventuality on a call out or a situation on the beach. 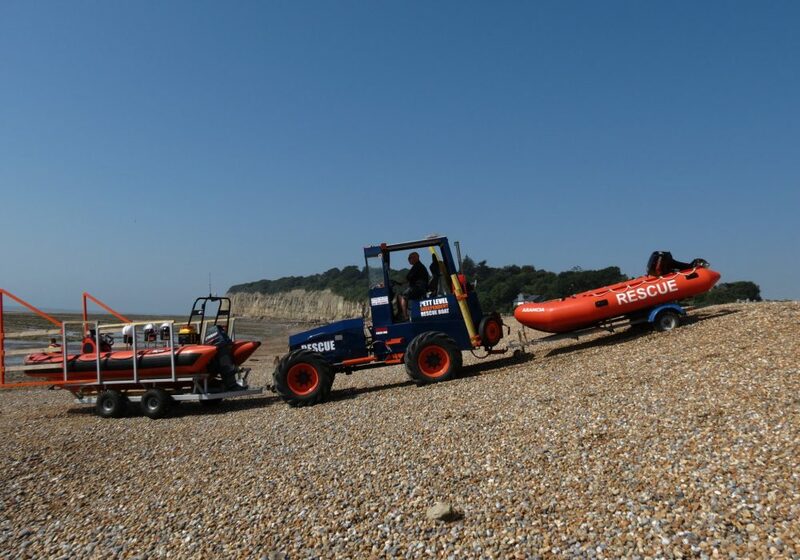 When we’re there, our boathouse base is a First Aid point for Pett Level beach, and now there will be many more first aiders around to help provide these services to beach visitors. 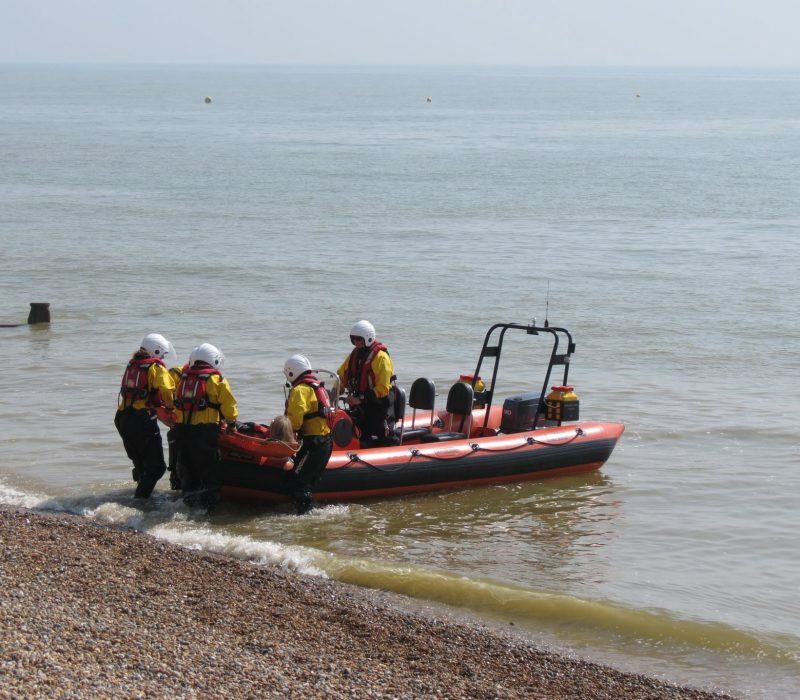 In fact, from now and particularly once more crew complete the training, we should have qualified first aiders available on the boats and at the base, at the same time. Special thanks go to Corrina for giving up her time to come and spend the whole weekend with us, and to Kev for organising it all. 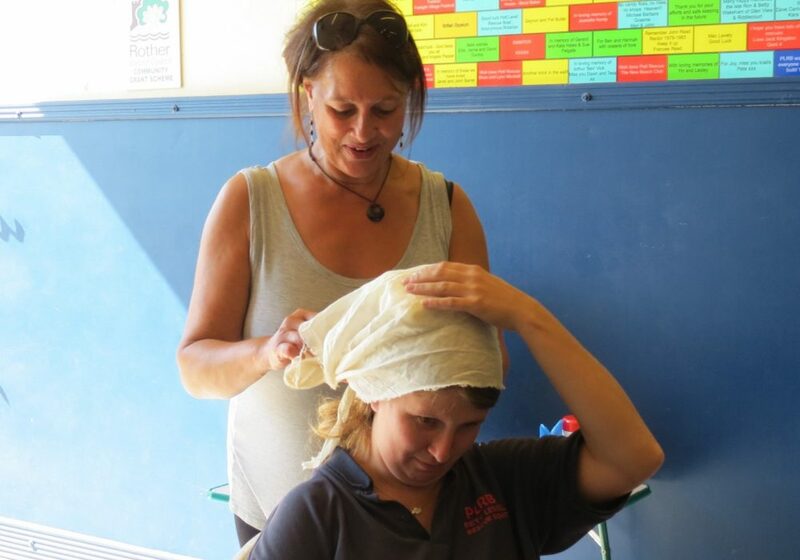 Oh, and for the fact that it’s happening all over again for another raft of crew members and trainees in the Autumn … Corrina was amazing so we can’t wait to welcome her back to do it all over again! 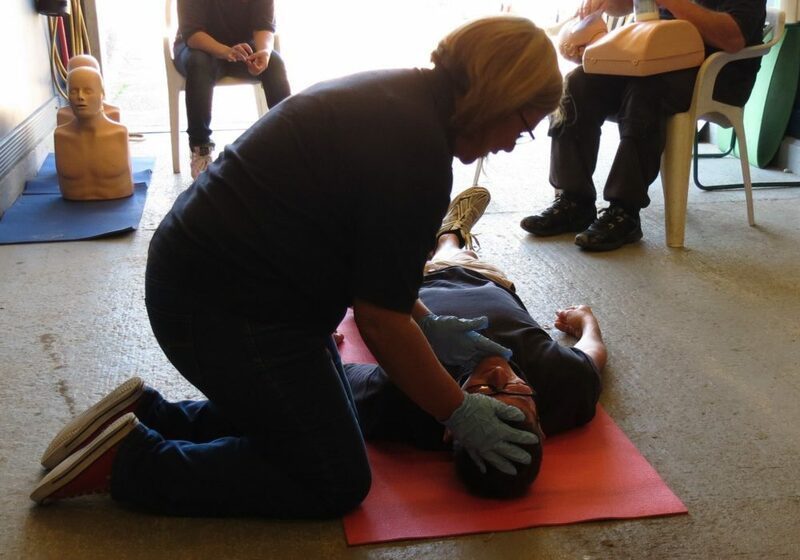 Thanks so much for supporting us with this training, Corrina! 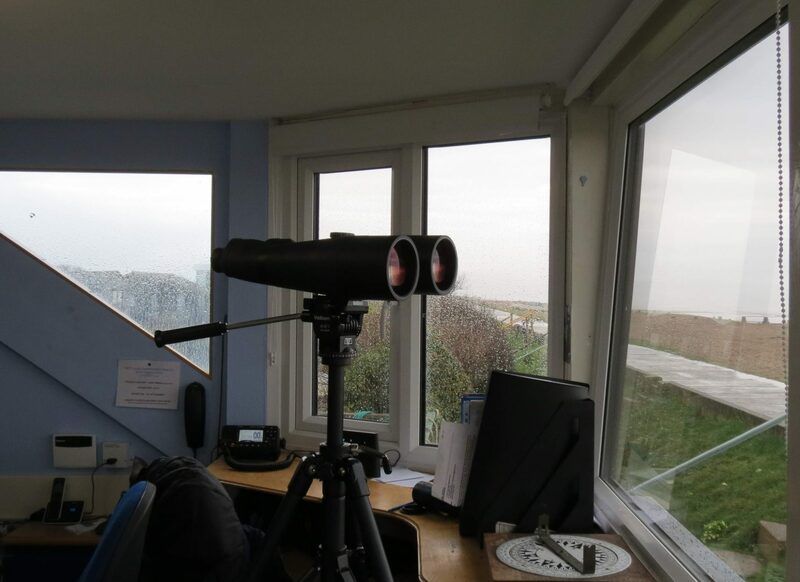 Pett Base to Pett Rescue … over? 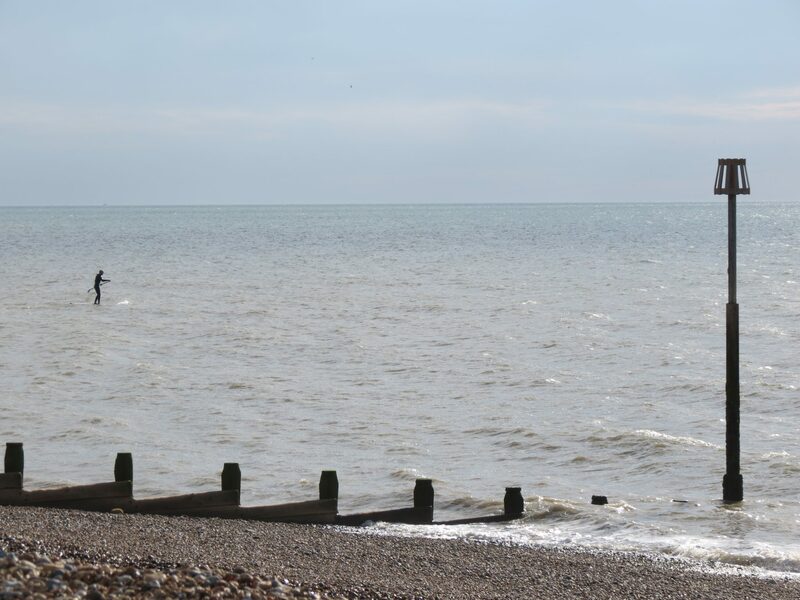 All over Pett, in fact! Another busy morning of training down at the base today! The boat house was given over to a wonderful crew of friendly and talented artists exhibiting work for sale in support of us – thanks so much to all of you for your support. 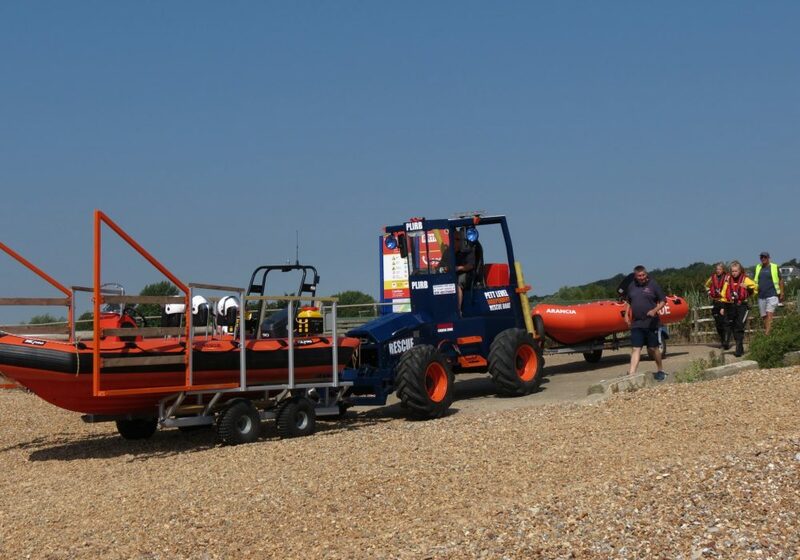 With the boat house being extra busy, this gave us a good chance to focus today’s training session on land rather than using the boat and launch vehicles. 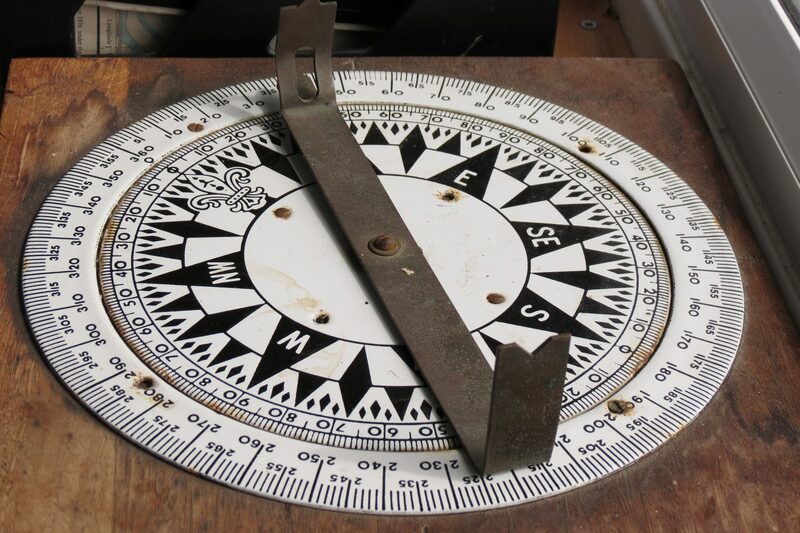 So radio and geographical co-ordinate and bearings practice were the ideal aspects for experienced crew members to support new trainees in learning. 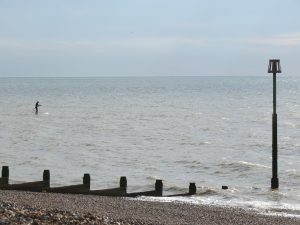 From the base, two separate crew teams were dispatched across the Pett area with radios, in order to practice radio calls, responding to and reporting co-ordinates and in reporting conditions / geographical positions accurately so that locations can be identified even without specif co-ordinates (as can arise in rescue situations). 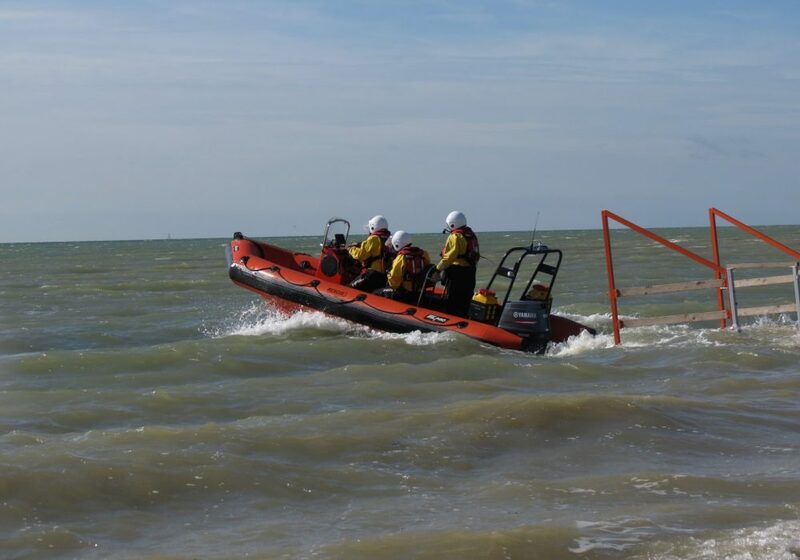 Trainee volunteers are all working hard to complete the training requirements needed to become fully fledged crew members and radio practice is a vital part of this. 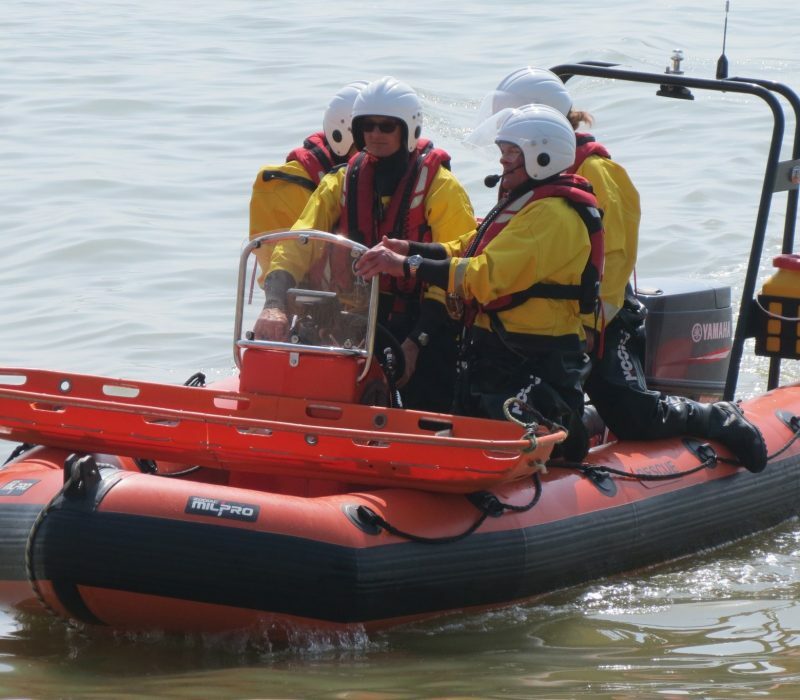 Many volunteers are also in the process of taking their formal marine radio course so today’s training also supports their progress in this. 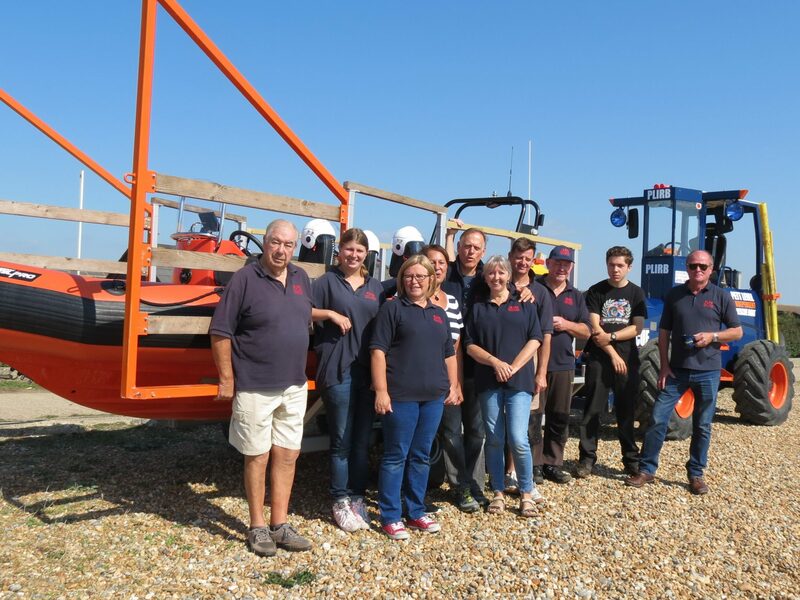 We’ve also been finalising plans for next week’s gala Open Day, so please pop the date onto the calendar and come along to see us … you’re assured of a warm welcome, fun, games and entertainment and a display using both boats. See you then! 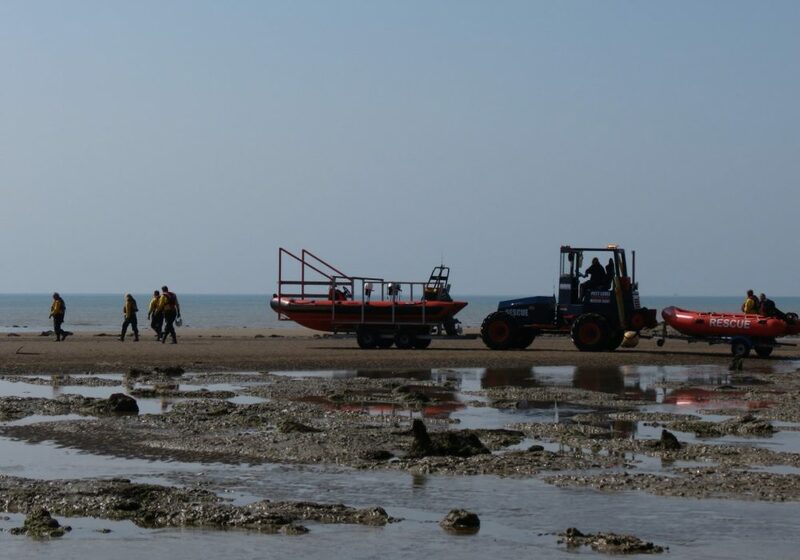 Today’s training session brought the base and boat crews the challenge of an exceptionally low tide and the need to launch both boats in order to practice towing and use of stretcher between the two boats. 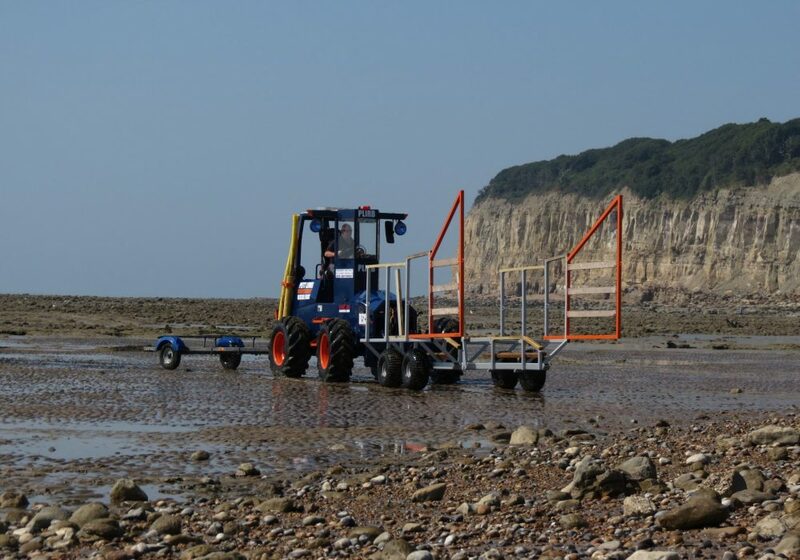 This meant that Kev had to get both boats down to the sea in tandem, using the tractor. 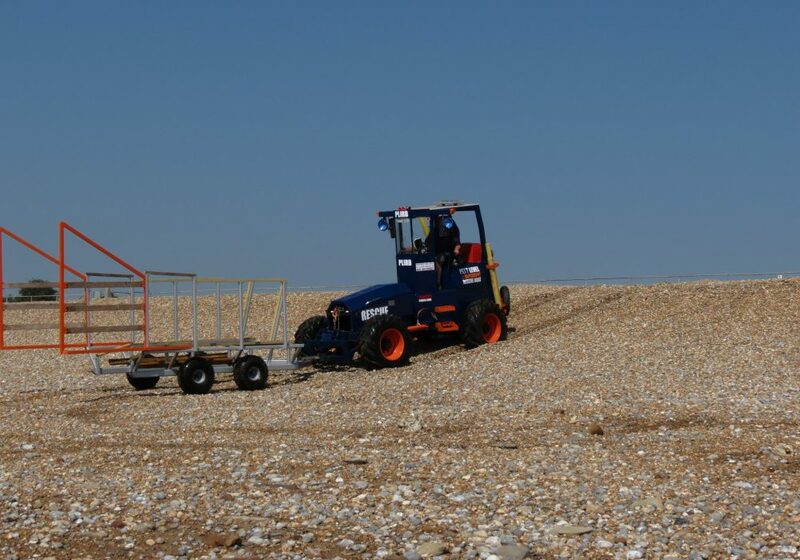 This kind of double launch is particular hazardous on the steep shingle ridge: it’s important to keep an eye on the front, to avoid jack-knifing the boat / tractor combination because if this happened, the rear would also jack-knife. 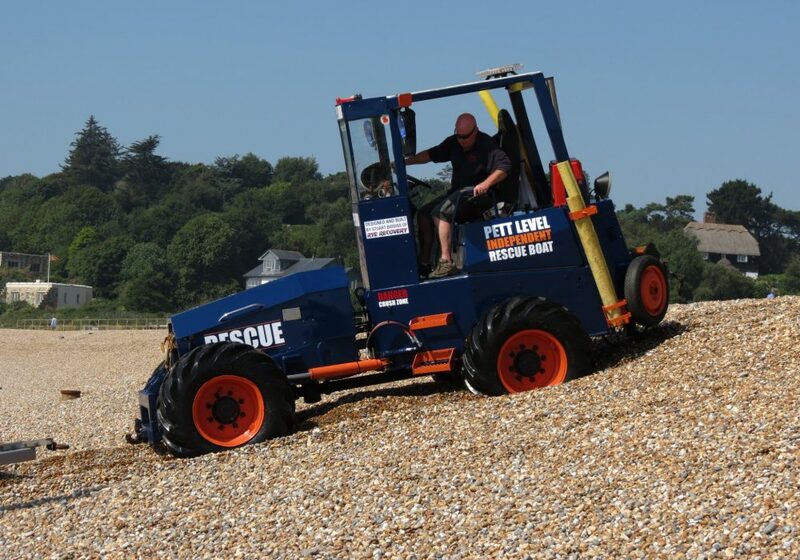 And that’s without the hazards associated with moving vehicles on the beach generally, and the additional problems of a low tide launch in the Pett beach area: submerged hazards, sinking sand and slippery rocks and timbers. 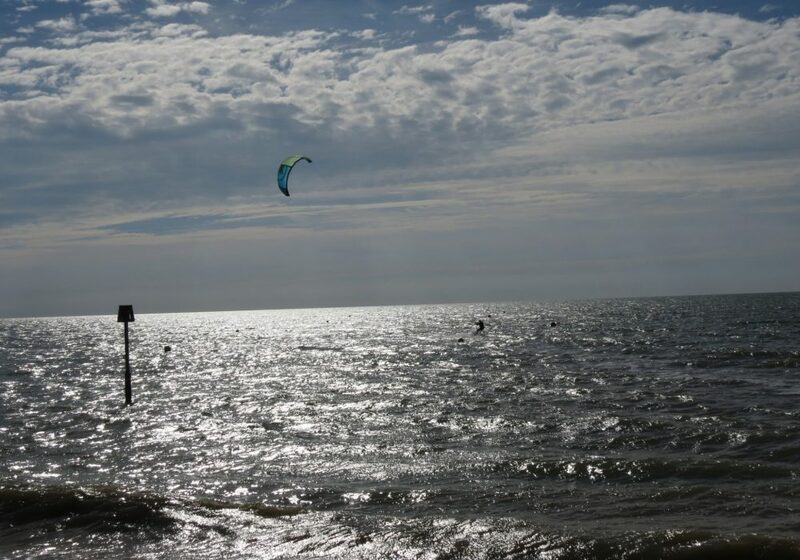 Oh and did we mention that on a bright, sunny Sunday in July the beach is already starting to get busy with swimmers, sunbathers, walkers and dog walkers? 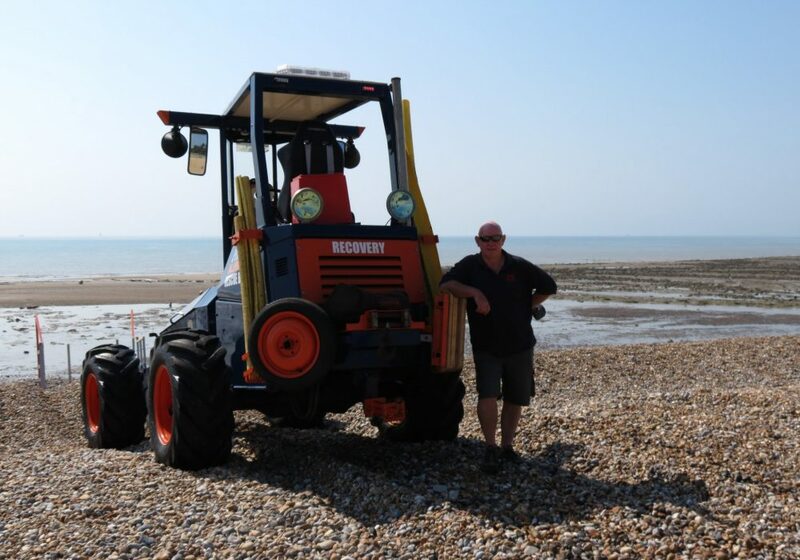 Thankfully, Kev’s not only up to the challenge but also extremely skilled in manoeuvring the tractor safely. 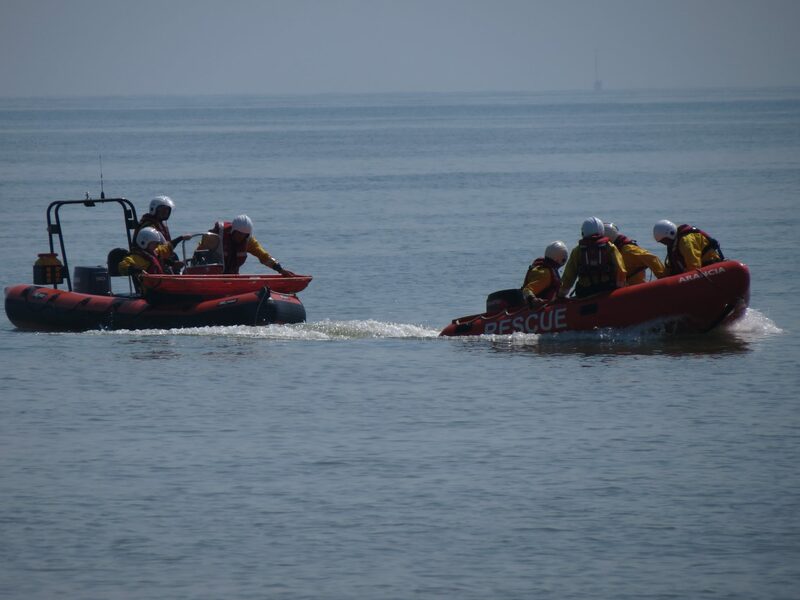 Once safely launched, the two crews practised boat towing between both boats – it’s particularly important that the crew of the smaller Tornado practice handling and controlling the towing of a larger boat, in case they need to take this action in a rescue situation. 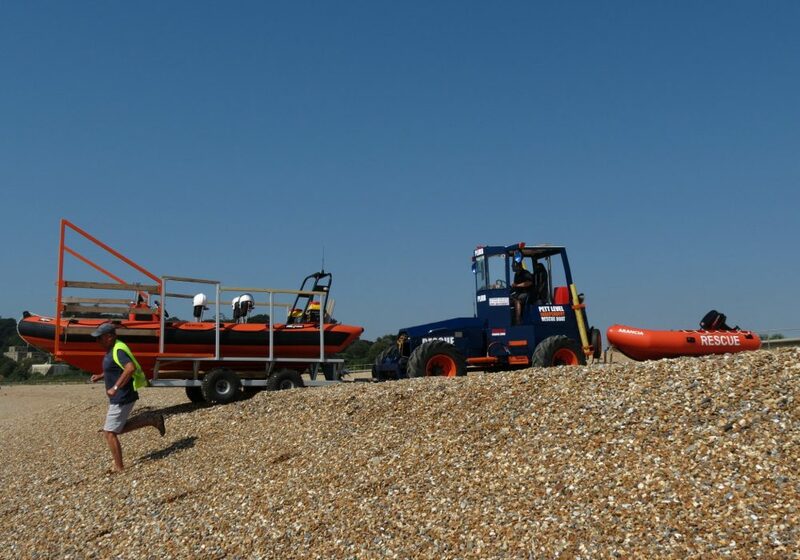 In this instance, although the term used is ‘towing’ technically the smaller vessel is actually using a controlled ‘push’ to manoeuvre the large boat to safety. 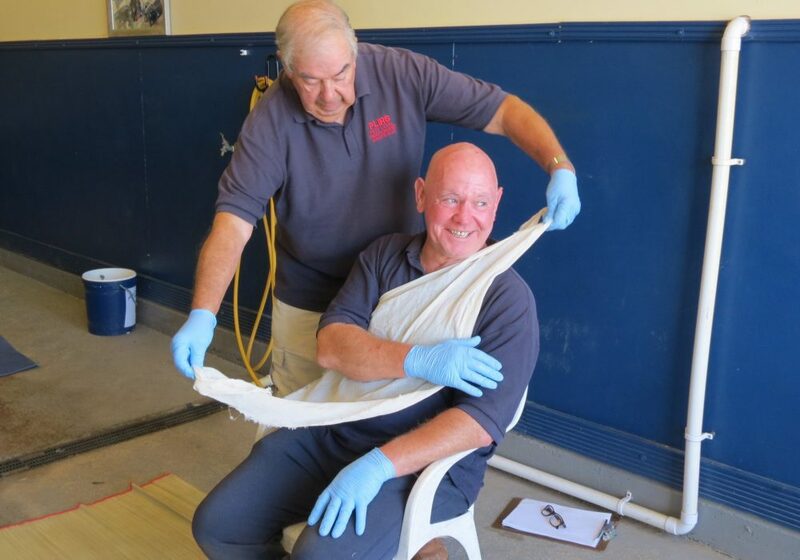 To ensure the casualty is comfortable (as possible) during transfer to the ambulance. 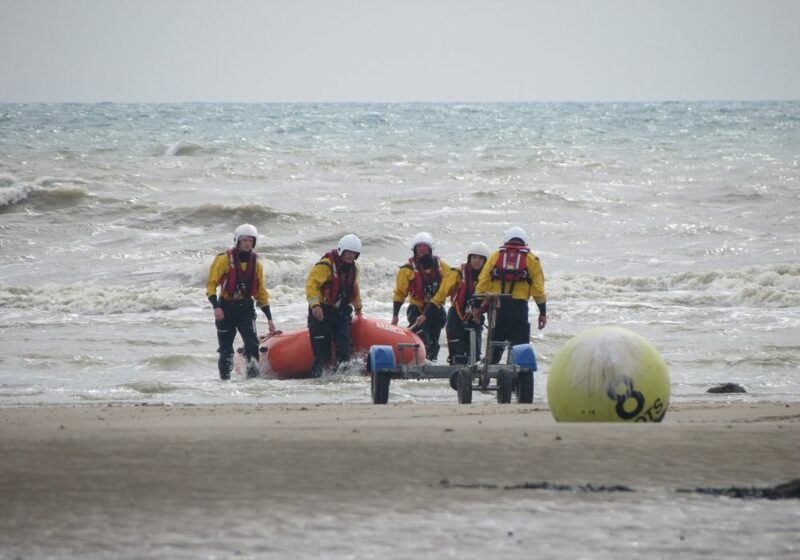 To ensure that crew are well practised in casualty retrieval. 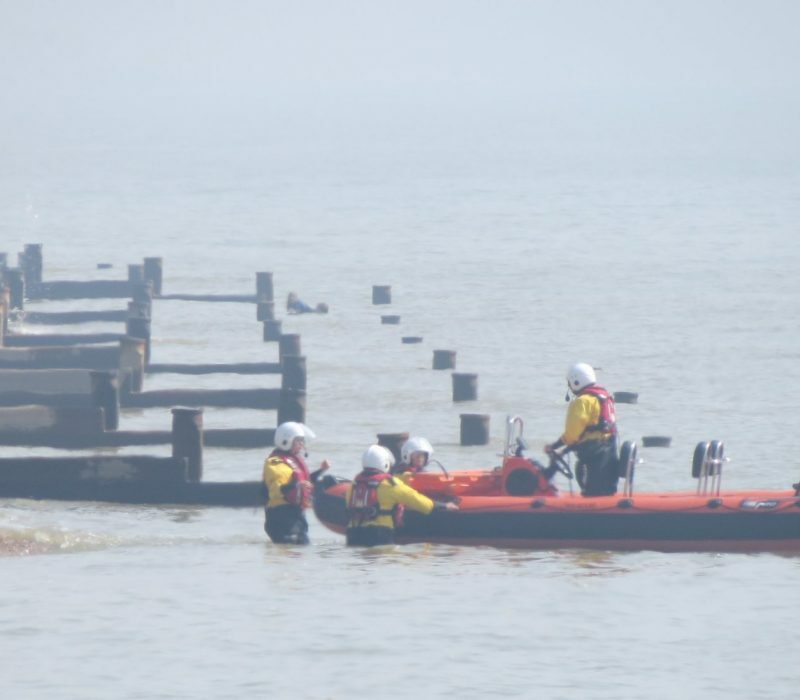 There are limited photographs of the crews actually training today as they were necessarily a long way from shore (and the paddling photographer) with such a low tide! 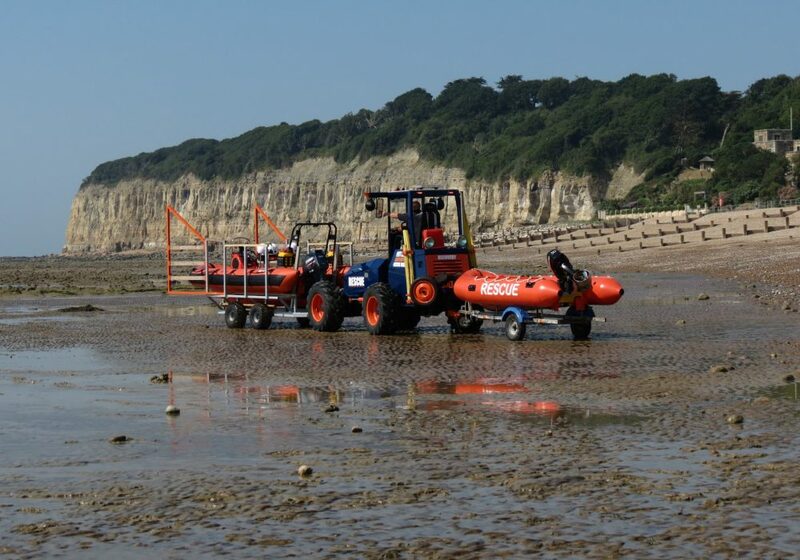 Two boats, one low tide, one successful training session! 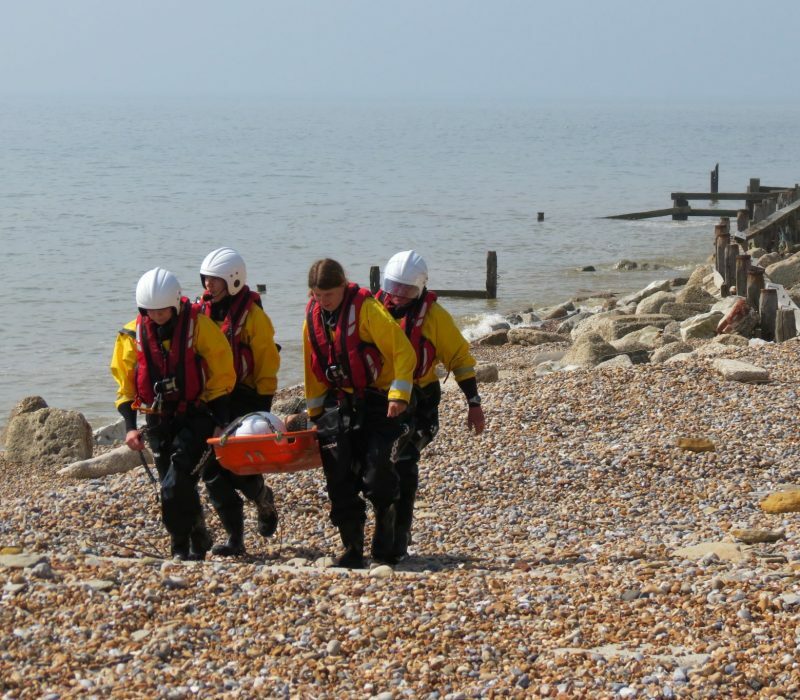 Back to Sunday May 27th’s casualty retrieval training and session #3 involved finding a casualty at the Cliff End of the beach. 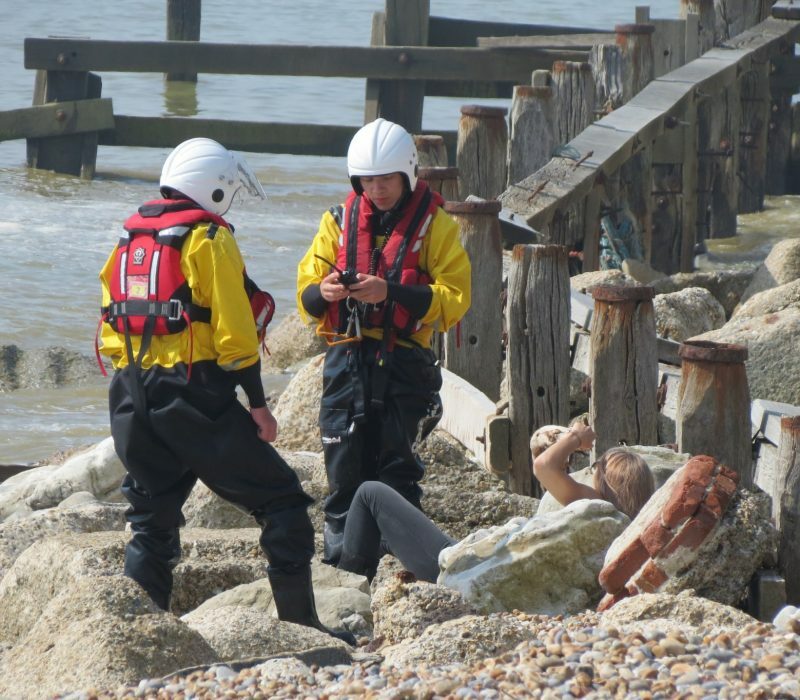 For training purposes, the casualty had fallen off the groyne and had sustained a hip injury. Of course, in this kind of situation, the casualty may be aware of ‘where it hurts’ in respect of an injury but of course there may be other hidden injuries too, so the first aiders in the crew had to treat and handle the casualty in a way which would minimise pain and prevent exacerbation of any other potential injuries typical in a fall, such as back, pelvis or neck injuries. 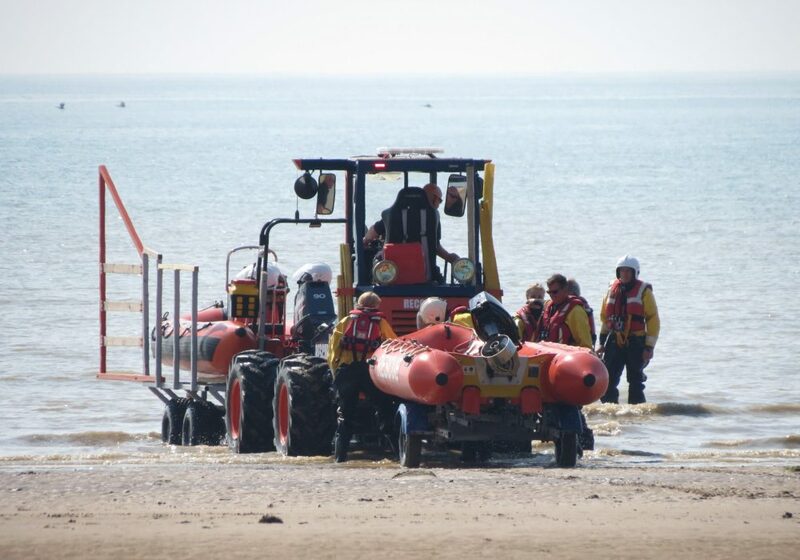 Once the injuries were assessed and it was identified that the stretcher would be needed, extra crew were brought along with the stretcher to help handle the stretcher safely across the very rough, rocky part of the beach. 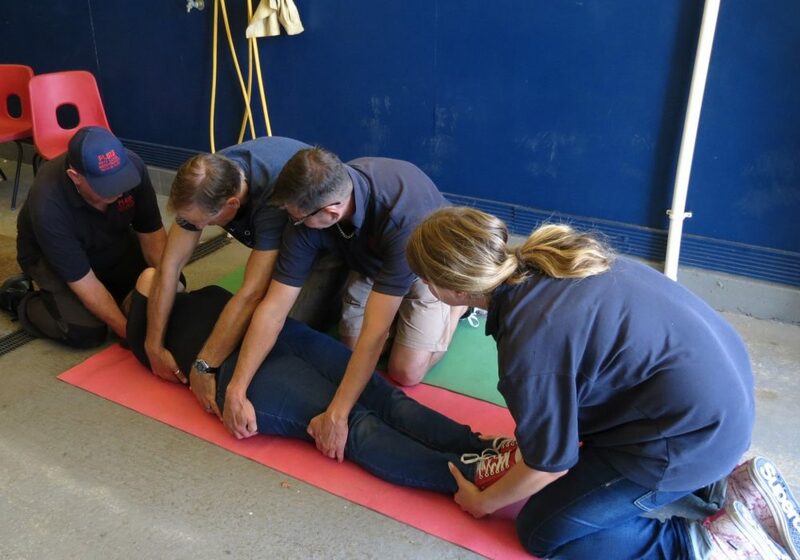 In a real-life incident an ambulance would have been called to be ready at base for the casualty to receive paramedic attention and transportation to hospital as quickly as possible.